Luxurious and Substantial Egyptian cotton Bed Linen made from the World's highest quality yarns in one of the highest thread counts available - 1000 threads per square inch. This product which will keep its thickness, softness and lustre for many years to come. The fitted sheets are simple with elastic corners (Up to 33cm Height mattress). 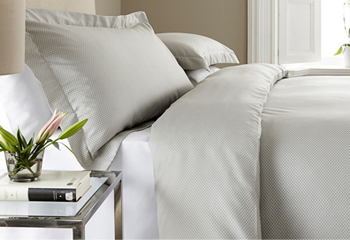 Flat sheets have an embroidery on the headboard marking the beginning of the hem.